His teaching methodology focuses on individual and small-group instruction. Boys who need special help receive it individually or in small groups from Rabbi Chazan and several associates, just as all boys are educated individually and in small groups. Thus, no youngster should feel humiliated because he is taken aside for "special" instruction; all boys are taught in this manner. Rabbi Chazan strives to be respectful of individual boys; he observed that discipline in Ukrainian schools was "severe" and "stifling". All applicants to the yeshiva are screened for intellectual capacity, Hebrew-language skills, and maturity. For those who apply from abroad, Hebrew-language interviews are conducted by Skype. For Chabad boys residing in Ukraine, Rabbi Chazan and his associates interview and observe candidates at Chabad-operated winter camps for boys in Ukraine. Rabbi Chazan noted that most Ukrainian Chabad boys have superior Hebrew-language skills because many of their yeshiva day school teachers are Israelis. The boys reside and learn in a suburban area in an oddly-designed two-story rental building originally intended as a small country inn accommodating only a few families at any time. Of fairly recent construction, building materials appear somewhat shoddy and flimsy. Capacity of the building is severely limited and may restrict natural growth of the yeshiva. It is planned that the residential yeshiva will move into the structure now used as a dormitory for Beit Chana when Beit Chana moves into its new premises, but several years will be required before all necessary renovations can be completed. For now, boys enjoy recess periods in a poorly-maintained adjacent outdoor basketball court and a large not-quite-level backyard. They also are taken on excursions to a local indoor swimming pool and certain other recreational venues. In discussions with several Chabad rabbis whose sons are enrolled in the yeshiva, the writer found enthusiasm about Rabbi Chazan and his teaching colleagues and with the style of learning embraced by the yeshiva. They observed that their sons were learning at appropriate levels, were pleased with the general atmosphere, and were maturing. 7. Under the sponsorship of Tzivos Hashem (Heb., The Army of G_d), a Chabad children’s organization, Rabbi Yossi Glick manages several children’s programs in the city. The best known of these are separate residential facilities for Jewish boys and girls from troubled home situations. Often referred to as “social orphans,” most of the youngsters are from single-parent homes in which the custodial parent is unable to provide adequate childcare due to substance addiction, impoverishment, or other problems. Some parents are imprisoned. A few youngsters were previously cared for by aging grandparents unable to cope with the needs of active, growing children. Rabbi Yossi Glick, a native of Australia, manages several Chabad children’s programs in Dnipropetrovsk. 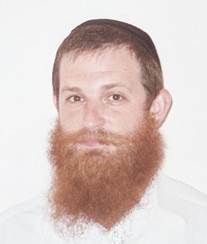 He also is the business manager of the new residential yeshiva katana. 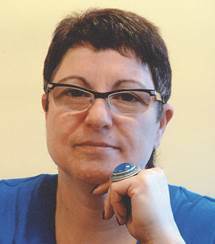 Photo: the writer (in May 2012). The total number of youngsters residing in the homes has dropped from 40 boys and 28 girls some years ago to 14 in each during the 2013-2014 school year. The reduced census parallels a general Ukrainian Jewish demographic decline and follows a pattern observed in several Jewish children's residential facilities in other Ukrainian cities. Each of the two Dnipropetrovsk facilities is supervised by young adult counselors, most of whom are only a few years older than their charges and none of whom has relevant education/social work/psychology background. Both homes are guarded by security personnel throughout the day and night. Rabbi Glick readily acknowledged finance-related shortcomings in management of the homes. The program cannot afford to engage properly-trained staff; those who do serve usually leave after one or two years, thus depriving youngsters of supervision continuity. Further, the program lacks capacity to advise youngsters on post-high school opportunities and usually loses track of residents within a year of their departure from the homes upon graduation from high school at age 17. Almost all of the residents attend the machon or day yeshiva. Recreational opportunities outside school are severely limited due to lack of funds. Visits to families usually are limited to occasional Sundays; Rabbi Glick has found that longer visits to dysfunctional homes cause psychological/emotional problems for the children that persist upon their return. Further, Rabbi Glick said, such visits may be expensive for the residential programs because parents or other relatives sometimes steal the clothing or shoes that the child is wearing or bringing and then sell these items in a street bazaar. The residential program then must replace the missing apparel. In general, said Rabbi Glick, financial constraints have forced Tzivos Hashem to curb its assistance programs to all impoverished Jewish children throughout the city, including those living with family members. For example, they no longer distribute food parcels to single-parent families or grandparent-led families. 8. Старший брат, старшая сестра (Older Brother, Older Sister) is an outgrowth of the Dnipropetrovsk Kehilla Project of the Jewish Community Relations Council of Greater Boston. Adapted from Jewish Big Brothers/Big Sisters of Greater Boston, the Dnipropetrovsk program is completing its Bar Mitzvah year, funded entirely by an allocation from Combined Jewish Philanthropies, the Jewish federation in Boston. Tanya Kaplunskaya, director of Older Brother, Older Sister, said that the project is well-known in the Dnipropetrovsk Jewish community; she even is approached by people on the street who recommend a particular child in need of an older companion. The current uncertain situation in eastern Ukraine, she continued, generates great stress, even among children; they fear for their own futures and welcome additional attention from a big sister or big brother. Tanya Kaplunskaya, a psychologist by training, is a member of a family long involved in Dnipropetrovsk Jewish life. In all, said Ms. Kaplunskaya, the current roster includes 70 pairs. Most of the older brothers and sisters join the program through the Hillel student organization, she stated, and the remainder connect through Jewish Agency young adult programs. Through contacts in the Jewish day school and elsewhere, she learns of children who would benefit from such a relationship. Her background in psychology enables her to evaluate both volunteer older siblings and candidate younger siblings and then make appropriate matches. Aware that many students and other volunteers in Ukraine lack the resources to plan and carry out the two-person outings that characterize many JBB/BS relationships in the United States, the Dnipropetrovsk program offers a number of large events in which many pairs participate, such as excursions to ice skating arenas and amusement parks. Light refreshments are served at these gatherings, which generally take place once each month and at holidays. Her monthly budget, which covers all event-related expenses, is between $600 and $700. Ms. Kaplunskaya added that many pairs also go on walks and engage in other low-cost activities on their own. Two little brothers have Down syndrome, said Ms. Kaplunskaya, and a third child is confined to a wheelchair. Although almost all participants, both younger and older siblings, have some Jewish roots, Ms. Kaplunskaya noted, not all are halakhically Jewish. Ms. Kaplunskaya has led several seminars on child development and psychology for volunteer older siblings and for their parents. She would like to organize a Shabbaton for children, the children's parents, and the volunteer older siblings, but such an undertaking would be very expensive and she sees little likelihood of receiving funding for it. Few participants, she observed, would be able to pay their own expenses and, thus, substantial individual subsidies would be required. 9. A Special Needs Educational Resource Center, located in a wing of the Beit Chana Jewish Women's Pedagogical College, enrolls 60 Jewish children, adolescents, and a few young adults. Some of the children are autistic, said Director Tamara Olshanitskaya, and many others are intellectually impaired or have other disabilities. The number of youngsters with cerebral palsy actually is declining, Ms. Olshanitskaya said, due to better obstetrical care. A few clients have not been diagnosed precisely, Ms. Olshanitskaya continued, but it is clear that these youngsters are severely impaired and unable to attend conventional public schools. Tamara Olshanitskaya, left has directed the Resource Center since its inception. She has spent considerable time in the United States, where her daughter and grandchildren now reside. Ms. Olshanitskaya said that her own friends in the United States worry about her during the current unrest in eastern Ukraine, but she hopes for the best and "жизнь продолжается" (life continues). Participants are assigned to one of four groups, depending on age, type of disability, and degree of impairment. Some children are prepared for entrance into public school special education classes, but others are so seriously impaired that public schools are unable to accommodate them. 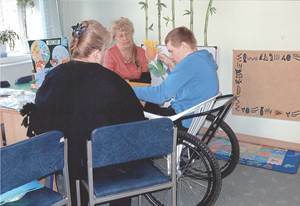 Some private schools exist for disabled youngsters, Ms. Olshanitskaya said, but they generally are very expensive; further, the smaller size and more welcoming atmosphere of the Resource Center is much more comfortable for many families. The Resource Center premises include eight teaching/therapy spaces in five classrooms of various sizes as well as one sports hall. Additionally, it has an outdoor play area with equipment designed for special needs youngsters. The program offers literacy skills, speech therapy, art and music therapy, physical education, and massage. A psychologist is on staff, and an experienced pediatrician provides basic medical care. The pediatrician, Ms. Olshanitskaya stated, is outstanding; he charges a reduced rate to the Resource Center, but will make house calls at night for his young patients and also intervenes with hospitals when necessary. Mothers trust him, Ms. Olshanitskaya continued, a sentiment that is often missing in Ukrainian medical care. The Jewish Medical Center also provides primary health care to Resource Center youngsters, a service that will expend when the JMC moves into its new premises. 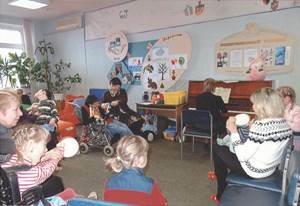 In the above photo at left, youngsters participate in a music class, using tambourines and other basic instruments. Most of the adults in the photo are parents, grandparents, or volunteers. In the above photo at right, a boy receives individual tutoring in basic math and reading. Note his wheelchair, a plastic yard chair in a wheeled frame. Photos: the writer. Families are referred to the Resource Center by hospitals, clinics, and sanitaria specializing in care of disabled children, stated Ms. Olshanitskaya. Often, she continued, fathers abandon their families at the birth of such youngsters. The demands of special-needs children are such that the mother is unable to work outside the home, thus leaving the mother and child (as well as other family members) in poverty. State pensions provided to the handicapped do not cover even basic expenses, Ms. Olshanitskaya noted. Many of the mothers are severely depressed and worry constantly about the fate of their children if they (the mothers) become ill or die. 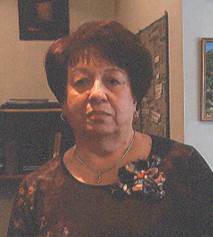 Ms. Olshanitskaya arranges some social activities, as well as counseling, for parents and other caregivers. The Jewish Women's Microenterprise Loan Fund and Project Kesher also offer programs to Resource Center mothers. The Resource Center cannot afford the social workers, psychologists, and special education teachers that it needs. It is very dependent upon volunteer helpers, among them retired teachers, each of whom comes to the Center several days each week to work with individual children. Parents and grandparents of client children also have responsibilities that sometimes extend beyond their own children. Ms. Olshanitskaya also noted the centrality of a specially-equipped passenger van to the Resource Center. A gift of Combined Jewish Philanthropies, the Jewish federation in Boston, the van is fitted with two lifts that bring wheelchair-bound youngsters into the van and then discharge them efficiently and comfortably. The van transports Resource Center youngsters and their parents between their homes and the Center. The Center could not operate without it, Ms. Olshanitskaya said. Ms. Olshanitskaya also expressed gratitude for a new activity, an adaptation of the warm home program, initiated for senior adults by the Joint Distribution Committee and subsequently operated by Action for Post-Soviet Jewry. In the Resource Center warm home project, Ms. Olshanitskaya continued, three to five Resource Center young-sters in the same age group, along with their mothers and two to three RC profes-sionals, meet in the home of one of the children. The children and parents know each other from the Center and are comfortable with each other, a key element of the under-taking, Ms. Olshanitskaya said. One professional leads the children in arts and crafts and other informal activities, while another meets with the mothers for adult-level informal Jewish education, psychological counseling, and art projects of their own. The Resource Center provides light refreshments (fruit and cookies) and the hostess mother provides tea. Gifts may be given to participants on their birthdays. Gatherings in children's homes, noted Ms. Olshanitskaya, enable Resource Center professionals to assess conditions in these homes, learn if children have their own space, etc. Rabbi Chazan mentioned briefly a Chabad residential yeshiva for the same age group near Moscow that some Chabad rabbis refer to as a "boot camp". The rabbis who support Rabbi Chazan have insisted that a different atmosphere prevail in Dnipropetrovsk. See pages 62-63 for further information about the ties between Dnipropetrovsk and Boston. For more information about Hillel in Dnipropetrovsk, see pages 23-24; for information about the Jewish Agency, see pages 57-59. See pages 27-28 for additional information about Beit Chana. See pages 44-45 for more information about the Jewish Medical Center. See pages 46-47 and 35 about the Jewish Women's Microenterprise Loan Fund and Project Kesher respectively. For information on the Action for Post-Soviet Jewry warm home program, see page 41. If the mother cannot afford to provide tea, the Resource Center will provide it, said Ms. Olshanitskaya. The Resource Center warm home program is funded by Dr. Judith Wolf of Boston and her family. The Wolf family has been a generous contributor to other aspects of the Resource Center as well.